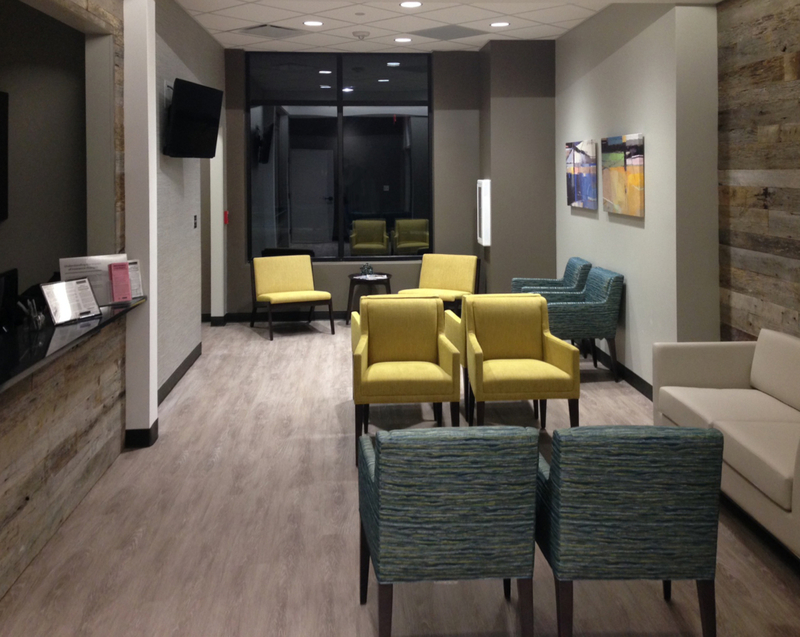 team at RdM Architecture and synergyone worked with staff, administration, doctors and nurses to establish the program and space plan for the optimal operation. Plans included waiting, business office, consult room, dressing rooms and sub-wait, two ultrasound rooms, two mammography rooms, two reading rooms, janitors’ closet and break room. 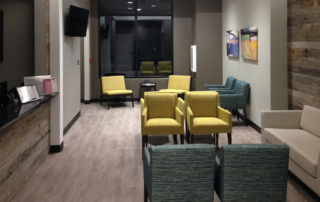 Separate staff and patient restrooms are also strategically placed throughout the space. The client asked for a spa like environment to offer patients a bit of a sanctuary while there for services that could render disappointing results. A contemporary space with some lively colors is used against a backdrop of neutral woods, wall coverings, paint and flooring. Highlights of the space include accent walls and recessed ceilings filled with reclaimed barn siding. Sconces and chandeliers compliment waiting spaces for subdued and softer experiences versus the harshness of the exam rooms. Antiqued wood looking LVT flooring surfaces both serve the ease of maintenance and warmth of the overall spa environment. Carpet is used sparingly for an even softer and sound absorbing feature in reading rooms and offices. Another unique healing health care atmosphere, Charlotte Radiology continues to receive wide acclaim and high patient satisfaction surveys from their clients.